Fred Sanders put together a nifty little collection of evangelist, expositor, Bible college dean, and pastor R.A. Torrey’s sermons entitled How God Used. 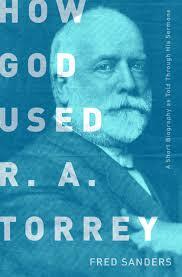 R.A. Torrey. Sanders introduces the work with a little bio, then adds brief introductory commentary before 13 representative sermons and addresses by Torrey. I’ve been reading it for a couple of days between other works and it’s been a fun little work so far. The preaching is dynamic, personal, and spiritually compelling. Also, as a preacher, it’s just interesting to see how much the game has changed, so to speak, since Torrey was calling people back to faith. One address I enjoyed, in particular, was his famous “10 Reasons Why I Believe the Bible is the Word of God.” Torrey, of course, famously edited the collection of essays in defense of orthodoxy known as The Fundamentals at the height of the Fundamentalist/Modernist controversies, so it’s unsurprising he dedicated significant preaching to the subject of the trustworthiness of the Scriptures. I have to tell you, this “argument” isn’t one that you just trot out in the middle of an apologetic dispute, especially with someone predisposed to disbelieve or be hostile to Scripture. Still, year after year, this insight into the unity of Scripture–it’s ability to consistently point to Christ through Law, Prophets, and Gospels, across various genres, generations, authors, and centuries is a continuous marvel. This is especially the case when you take off the modernist blinders and begin to pour over the various narratival and typological continuities. The Scriptures truly are a marvelous Temple of God’s truth. But Torrey is right–it’s not a unity that just lies there on the surface. It’s the kind of thing that you come to see once you give it the sustained attention and care that it deserves. But once you see it, much as Moses face coming down from Sinai, it shines with the reflected glory of God. ← In What Ways Is God our God in the Covenant of Grace?